JM1/5 (as JM1/4) but engines beside each other with one prop. The designs JM1/1 to JM1/5 were not accepted by the Navy. Therefore a sixth design was developed as a monoplane in all metal construction. An order for three engined seaplane was given by the Navy in 1918. But due to the end of WWI this project was not finished. The next seaplane design was the JM.2. This aircraft was a fighter and combat seaplane, which was started in 1917. The cantilever monoplane was also designed by Jaeckel. 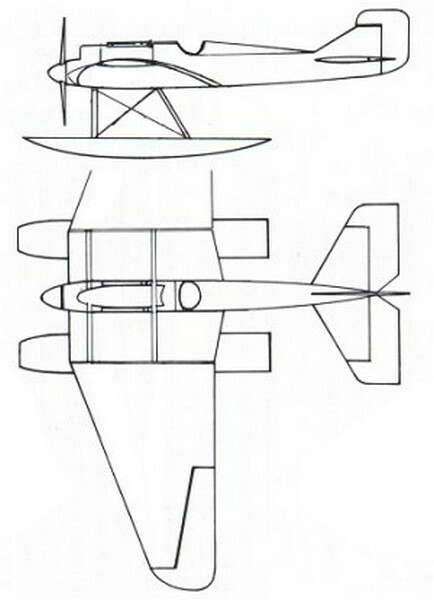 A parallel design was developed as a dualwing aircraft under the designator JM.2-II. An interesting fact is, that the JM.2-II got a wooden structure, which was fairly untypical for Junkers designs. This resulted from RMA fears of metal structures used in sea water environment. The RMA was interested in the second design and a developement order was placed in January 1917. In March 1917 Junkers advised Jaeckel to change the design to a monoplane aircraft. This was done under the designator JM.2-III. Again the JM.2-III got a wooden structure. Major diffculties result from the bad pilot view below the aircraft, which was caused by the larger wing area. None of the JM.2 designs reached a prototype status. The project was finally abandoned and the first Junkers seaplane became the J11 in 1918. 1 x Mercedes D III (118kW) n.a. The JM.4 was developed due to a request of the German Navy in April 1917. The aircraft should be designed as a submarine aircraft, which could be mounted onboard the submarine within half an hour. Two Junkers designs JM4/I and JM4/II were developed as all metal constructions. but none of this designs were finalized. The JM.6 is floating sea biplane for surveyer missions designed by Jaeckel in 1917. Two designs JM6/Ia and JM6/Ib were developed but not built.